Over the past six years I’ve been building consumer-oriented report health care cards pretty much non-stop. The field is young and short on evidence, but it’s interesting work with noticeable impact. However, the truth is that the largest portion of readers of these report cards are not consumers, but providers. To that end, I have long been wanting to build a report card for providers, not only to report their data but also to link directly to freely available improvement tools and knowledge directly from the report. My goal being, not only identify poor performance but right there, in the data, link to relevant interventions to impact that data in a positive way. I met with the Commonwealth Fund earlier this year and they were looking to build something around their Why Not The Best? 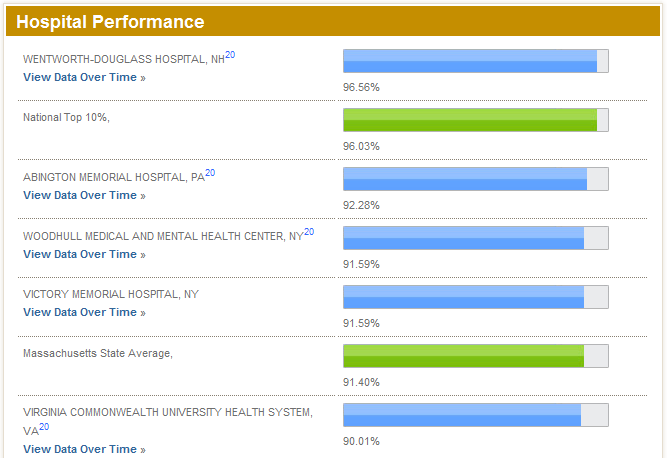 National Scorecard on U.S. Health System Performance. The Fund was looking for a vehicle to deliver their high performer cases studies, wherein hospitals identified as being high performers in a given set of measures were interviewed and the resultant wisdom distilled into case studies for other hospitals to learn from. 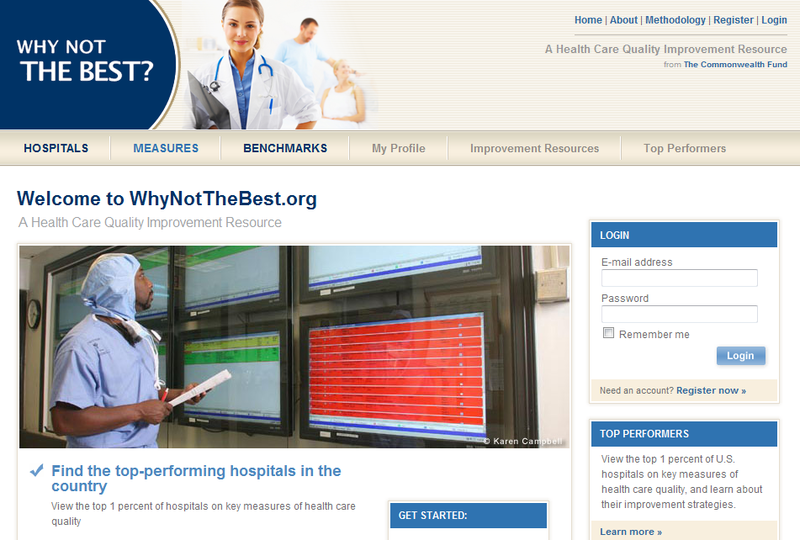 After many, many sleepless nights, I’m hugely proud to announce the launch of www.WhyNotTheBest.org – a quality improvement resource for providers from the Commonwealth Fund. A ton of very talented people have been working on this and we are all very, very excited to see how the site is received. The site includes all clinical quality and patient satisfaction data ever released on CMS’ Hospital Compare. This means 24 clinical measures and 10 satisfaction measures. 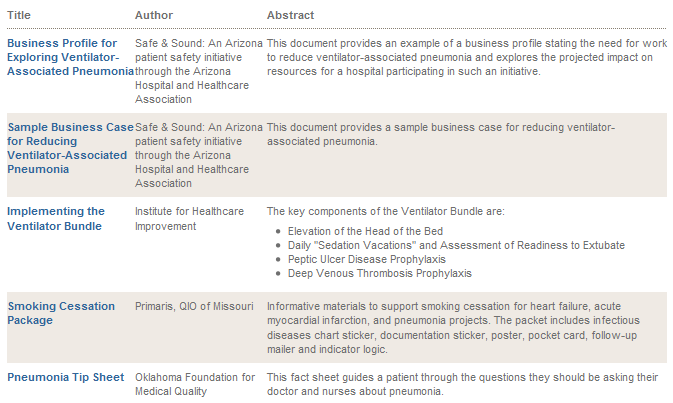 In addition, we created 5 summary scores, 4 being topical and one overall composite quality measure. Users can register for a profile that will remember all their choices for the next visit. This is important as there are many ways to personalise this site. Profiles are a basic three step process, you choose hospitals that you wish to compare yourself to, then choose measures you wish to track, then choose benchmarks of care you wish to compare against. We have every hospital in the US that bills Medicare. This is about 4500 hospitals. We have collected the quality and satisfaction data since the launch of the public dataset. Using this data, we can calculate state and national averages, as well as top percentiles. Commonwealth then asked us to identify just those hospitals that reported all measures and had at least 30 patients in each of four topics, and using that subset we further stratified the population to ascertain the high performing hospitals. This means that for any measure, you can load the current top 1% of hospitals for each measure. You can choose a hospital to add to your profile in three ways. First, you can simply start typing a name and the database will let you know if we have a match. Another interesting way to build a group of hospitals would be to find facilities that are like your own. 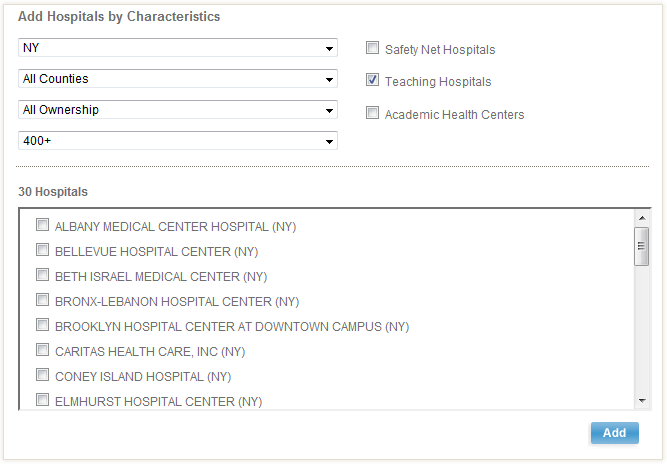 Users can choose from a variety of characteristics to whittle down the list to a useful set of comparator hospitals. In the example below I’ve asked for all teaching hospitals in New York with 400 or more beds. 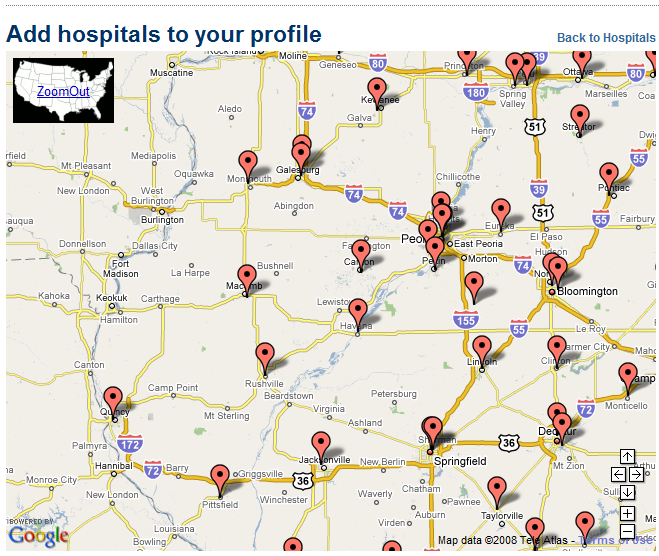 Finally, users can simply browse a map and grab hospitals of interest. We don’t limit the number of hospitals you can save to your profile, but if you add more than 50 the site will start to look a bit busy. Theoretically, you could store all hospitals in the country, but don’t call me when it takes half an hour to load. You can then choose any or all of the measures and benchmarks, these will then be available to you in any charts you choose to generate, and this is where things get interesting. We have implemented a dynamic charting application that will build charts on the fly based on your choices and your profile. This means that for any chart you choose to load, it will populate dynamically based on the hospitals, measures and benchmarks you selected. 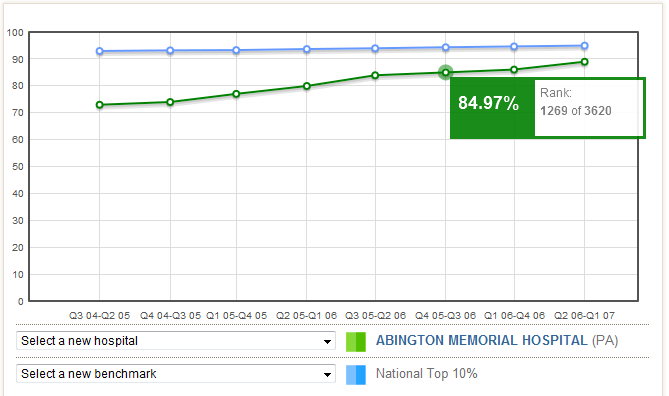 You can see in the example that we even calculated each hospital’s rank in the nation for a given measure. Among other things, you can download a comma separated file of the data used to create the chart, save the chart as an image to use in Powerpoint or similar, and click through to browse related case studies and intervention tools. There are a wealth of additional features, please stop by and kick the tires! The site is www.WhyNotTheBest.org – enjoy!